A value package, the 2017 Toyota Highlander LE offers many features at the most affordable price in the lineup. You can check out your Highlander choices at Pitts Toyota dealer serving Dublin, GA.
Georgia families will appreciate that Toyota uses high solar energy-absorbing glass on many windows. UV reduction glass is also a priority with the added bonus of rear privacy glass. Exterior standards include power-defrost side mirrors and self-regulating high beams. Even in this basic edition, material quality is high. Soft touches grace the door trim, the roll-top center console, and the in-dash electronics bin. Taking care of Georgia summer heat, three rows of vents direct air conditioning to every child. You can choose the fabric-trimmed seats or step up to the SofTex leatherette seats in the LE Plus. The cockpit is anchored by a three-spoke steering wheel with fingertip audio controls. Optitron instrumentation adjusts to suit light conditions. On the dash, a 4.2-inch multi-information display keeps you informed about vital statistics. Bluetooth audio streaming and an integrated reverse camera are part of the Entune touchscreen system. Get pre-approved. In addition to more airbags than the average three-row SUV, the Highlander has a suite of standard crash avoidance capabilities. These watch for lane departures, pedestrians, and forward collision dangers. If needed, the car can steer back toward the lane lines or slam on brakes to avoid hitting a person or car. 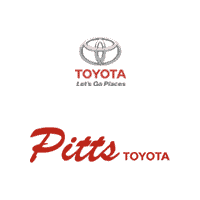 Picture your family in the Highlander LE at Pitts Toyota dealer serving Dublin, GA. A test drive will tell you more.